The middle of September has been a very hectic period for Agiliway in terms of traveling. 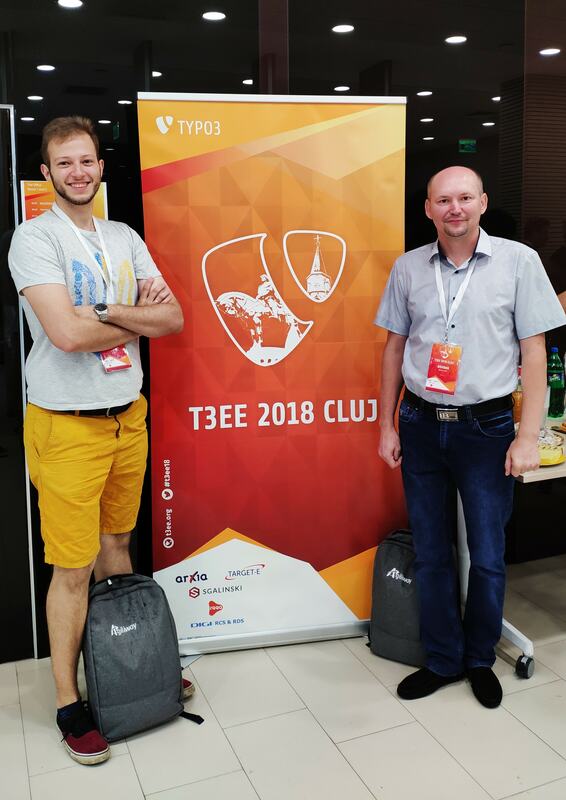 While a part of our team presented our company at an exhibition stand at DMEXCO, our CTO Bohdan Dmytryshyn and TYPO3 engineer Andriy K. attended TYPO3 East Europe conference held in Romania on the 14th-16th of September. Agiliway is a recognized TYPO3 expert, actively promotes this technology and has one of the biggest pools of TYPO3 specialists in Ukraine. Thus, it is critical for us to attend such community events and stay on top of the TYPO3 news. TYPO3 has an active community and organizes dozens of events each year: conferences, camps, sprints, DevDays, etc. TYPO3 East Europe (T3EE) is held annually in Cluj-Napoca, which is one of the biggest centers of IT industry in the country and boasts an incredibly high concentration of TYPO3 developers. 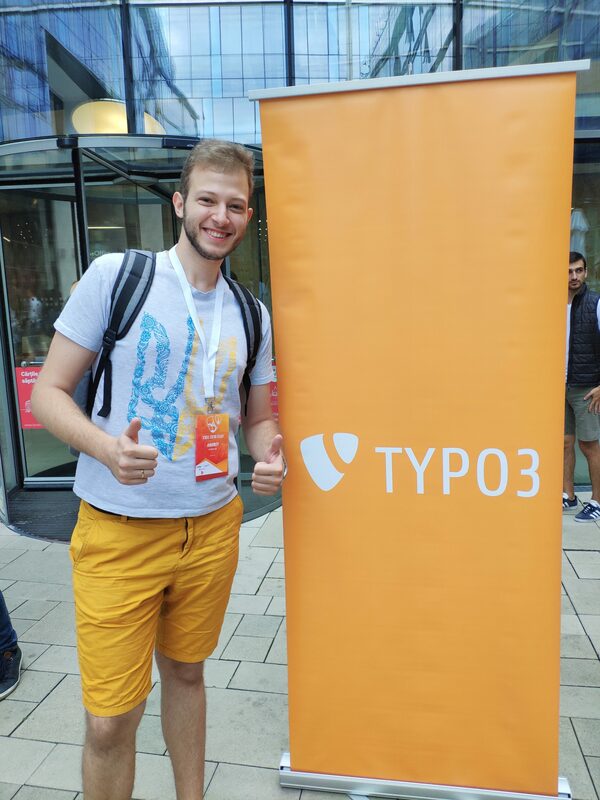 The goal of the conference is to involve developers and enthusiasts to further popularise TYPO3 in the countries where it is not yet well known. Besides this, TYPO3 community events are used for the official certification of TYPO3 specialists. Our leading TYPO3 engineer, Andriy, who has multi-year experience with TYPO3 and earned a certificate of a TYPO3 CMS Integrator a few years ago, used this chance to gain another official recognition from a TYPO3 community and took the certification exam. Thus, we can proudly congratulate him on successfully passing the exam and getting international recognition and an official title of a Certified TYPO3 Developer. Agiliway team is always looking for new knowledge and experience, and the conference was another means to gain it. We could listen to the latest TYPO3 news and plans, in particular, obtain first-hand insights into the latest TYPO3 version. In addition, having reported on a case when it took 10 years to detect and correct a bug, a conference speaker initiated a heated discussion of issues other companies and developers faced and the ways, in which they resolved them. Our CTO, Bohdan, was also invited to participate in a roundtable on the opportunities for TYPO3 education as appreciating a great learning curve of TYPO3 and a high entry level, the community seeks opportunities to introduce TYPO3 as a course in educational establishments. An active member of a TYPO3 community and a leading company with strong TYPO3 expertise in Ukraine, Agiliway is happy to share our thoughts and experience with the community and bring new ideas back to Ukraine. We are looking forward to visiting other community events. Whether you are planning your attendance too or need TYPO3 development or integration assistance, don’t hesitate to contact us.